Labour MPs have called on Jeremy Corbyn to strike a Brexit deal with Theresa May – without demanding a second referendum. In a move which highlights the party’s Brexit splits, 25 MPs – including some shadow ministers – wrote to Mr Corbyn to say an agreement was now “within reach”. The letter came ahead of a second day of talks between Mr Corbyn’s and Mrs May’s teams, who are attempting to find an agreement to break the Brexit deadlock. One rumoured feature of yesterday’s talks was a “devolution lock”, which would force a future prime minister to secure the consent of Scotland, Wales and Northern Ireland before they can alter the UK’s future relationship with the EU. Parliament cannot bind its successors, but a lock would place a significant hurdle on a Brexit-supporting future prime minister to rip up a customs union deal agreed by the current House of Commons. A senior Tory source, close to the talks, poured cold water on the idea however. A Labour source said the proposal had been “leaked by the government for their own purposes”. Aside from policy leaks, the Commons also saw a major water leak from the roof during a backbench debate, organised by Aberdeen South MP Ross Thomson, on HMRC’s methods of recouping unpaid tax and national insurance yesterday. MPs had to be sent home more than two hours early while Commons maintenance staff battled to plug the torrent of water spilling into the chamber. The crumbling condition of the 19th-century estate is a longstanding issue, with refurbishment works constantly being pushed back due to their enormous cost. Meanwhile, the House of Lords was poised to sit through the night to consider a controversial Bill that would force the government to extend the Brexit process to avoid a no-deal. Tory former chancellor Lord Lawson, speaking in the debate, warned of “undesirable insurrectionary forces” if Parliament refuses to accept the result of the EU referendum. He was joined in his concerns by Conservative former leader Lord Howard of Lympne, who said the argument for rushing through the legislation was “the pretence which tyrants have used down the ages”. The veteran Tory politician urged the Lords to act as a “brake” on the actions of the Commons, which he accused of breaching the conventions of the nation’s unwritten constitution. Ministers have warned that the Bill, tabled by Labour’s Yvette Cooper and passed in the Commons with a majority of just one vote on Wednesday, could create the risk of an “accidental no-deal Brexit” because it gives MPs a vote on any extension obtained by Mrs May next week. 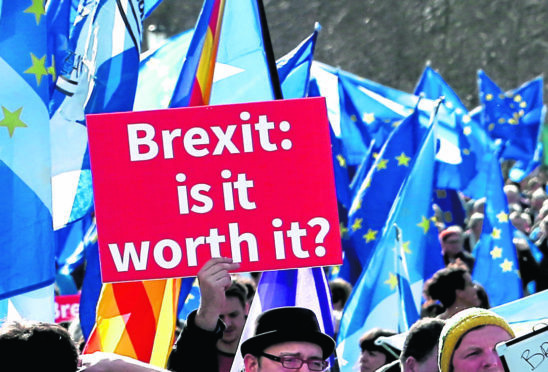 Brexit Secretary Steve Barclay told the Commons the measure could backfire if MPs reject the proposed delay, as there would be no time to renegotiate it before the deadline for departure on Friday. Mrs May’s official spokesman told reporters: “On Wednesday next week, the European Council could propose an extension of an alternative length to that put forward by Parliament, and under the Bill the Prime Minister would have to return on Thursday April 11 to put that proposal to the House.